It has nothing to do with adding any chemical ingredients or needing to get additional pricy equipment to do so. What you need is just a porcelain (ceramic material) Chinese soup spoon! Yes, the porcelain Chinese soup spoon. Seriously, I am not sure why this works. It’s simply an old folk’s method which believed in my family. And, guess what? It works, somehow.. What you do is simply put the porcelain/ ceramic spoon into the pot of congee while cooking. Same thing, you still have to stir the rice porridge constantly while simmering, till all the rice breaks down, but with the same time and effort, the congee will be two times smoother and softer, as compared to not adding the ceramic spoon in it. Don’t believe it? Me, either, at first. But, look at my chicken porridge. It was thick, silky smooth, and soft. The rice grain has almost all emerged and became a viscous broth. At least, it yields a great mouthfeel, to me. I compared it with those rice porridge/ congee dish I’ve cooked without this trick, this just amazed me with its cottony soft consistency in the palate..
Don’t ask me for any scientific proof, please… And, I am not sure also if you could use other porcelain utensils to do the same. I guess you just have to try it to belive it (winking smile)! 1) Rinse rice grain 1 to 2 times. Boil rice grain with a pot of water over high heat. When water is boiling, dissolve chicken stock cube in the pot. When dissolved, add in whole piece of chicken breast meat/ fillet to cook for 10 min. When chicken is almost done, remove from pot, and let it cool before shredding it into small pieces or thin stripes. 2) Reduce heat to low fire. Add a ceramic soup spoon into the pot. Now, stir the rice porridge constantly until the rice breaks down, for about 20 – 30 minutes. Briefly press the rice with the back of the soup laddle, occasionally. *Don’t break the porcelain spoon in it! 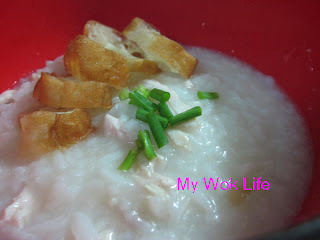 4) When the rice porridge is almost done with the desired consistency, add in chicken pieces. Simmer the porridge and chicken meat for another 5 – 10 minutes. Add salt and pepper to taste. 5) Remove the porcelain/ ceramic spoon from the pot. Laddle porridge into bowl(s), garnish and serve hot. A bowl of such simple chicken porridge counts about 200kcal. This is low fat dish that benefits any dieter and weight-watcher. Or, cook this stomach-soothing food to nurse one who is recovering from a cold/ flu back to healthy stage (smile). Tips: Use chicken broth instead of plain water to boil the porridge for more frangrant result. If chicken broth is used, omit the addition of chicken stock cube. Thanks for sharing. Your home cooked meals reminds me of my late parents & granny. They taught me all about simple but tasty chinese dishes. Oh yes, I apply the same method by add in a ceramic chinese spoon whenever I cook porridge or red bean, green bean dessert . I was told it helps to fasten the cooking process and the the rice or bean break up easily thus produce a more softer result. BTW, I bookmarked some of your recipes to add in my favorite recipes collection. My grandmother does this too. From a scientific perspective, porcelain have high specific heat capacity (1085 J/kg C), simply means that it can store up a lot of heat in it. So imagine you have a existing heat source from your stove (external) and another extra heat source which is directly inside your porridge. This extra heat will make your porridge to cook faster and at the same time break the rice into smaller fragments hence the smother texture.